Heat olive oil in a large pot over medium heat. Add onions, carrots, and celery and saute for 5 minutes. Stir in garlic and stir for 30 seconds. Add all remaining ingredients and bring the mixture to a boil. Lower the heat to a simmer and cover. Cook for 1 to 1 1/2 hours until the peas are softened. Remove the pot from the heat. Take the ham hocks out of the pot and remove the skin and bones. Chop the meat and set aside. Use a stick blender to puree some of the soup, giving it a thick and creamy texture. I prefer a thicker, chunkier soup so I do not puree it at all. Return chopped ham to the pot and adjust the seasonings as needed. You may want more salt/pepper. I promise it only looks like baby food. Gerber ain't got nothin' on this bowl. 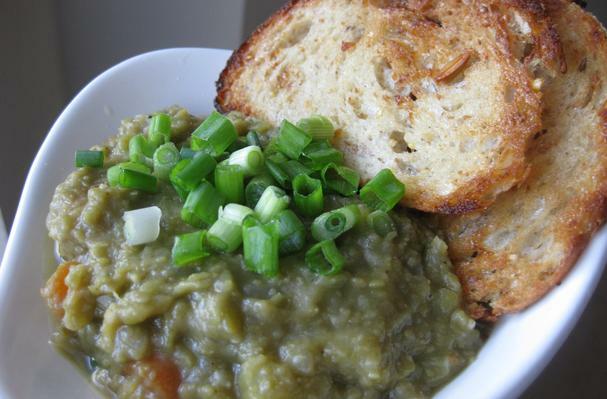 Honestly I'd never had split pea soup before and didn't expect it to be so full of flavor. It is creamy and rich. The peas offer up their natural sweetness; there are savory notes of thyme and bay; and the ham hock gives the pot a deep smokiness. I haven't enjoyed eating a bowl of green mush this much...well, I've never enjoyed a bowl of green mush, so this was an exquisite first time.